Big game, wingshooting and Dorado fishing. WOW! 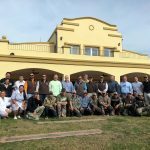 Argentina’s Best Hunting is one of the only companies that offers you the most diverse type of programs that Argentina has to offer: Wingshooting, Big Game, and Fishing, all in one program, along with 5 stars accommodation, gourmet meals, service and attention to every single detail. 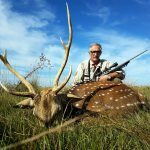 Morning: Upon arrival to EZEIZA International Airport in Buenos Aires, your party will be met by an Argentina’s Best Hunting representative who will assist with gun clearing at customs (if traveling with guns) and then will transfer you on a short drive to domestic airport. If using private charter services, you will be taken to FBO Private Flight terminal at international airport directly after custom clearance. Note: commercial domestic flights in Argentina do not depart from the “Ezeiza” international airport, making necessary a drive across town to the domestic airport, “Aeroparque”. Your party will be escorted by a rep. throughout this transfer. 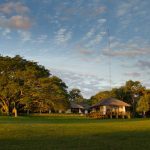 After a 50 minute flight, you will be met at Santa Fe or Parana Airport by Argentina’s Best Hunting Staff who will drive you to Estancia Cortaderas lodge where you will be welcome with Argentinian appetizers followed by an exquisite gourmet meal. 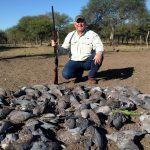 Afternoon: You will start your Hunting adventure with dove shooting after a short drive to the field, where everything will be set and ready for the fun to begin. At the end of the hunt, we drive back to the Lodge, where you will be able to relax at the Spa, enjoy a great meal and rest. 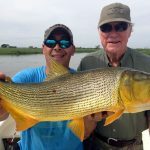 Morning: The day will start with a full breakfast and straight to the river to have an amazing fishing experience with the beautiful and aggressive Golden Dorado Fish. Midday: Back for another gourmet meal at Estancia Cortaderas, you will be greeted with drinks and snacks, after a wonderful fishing session. Afternoon: You have rested at the lodge and now you are heading for another high volume dove hunt, and by now you know you are the one who will set the limit. After this hunt, we’ll drive you to Malalcue Lodge, for dinner, SPA, and relax time. The day will start early with a full breakfast and go straight to the hunting field, and have your first experience with Big Game; these 2 full days you will have the possibility of hunting Wild Boar, Blackbuck Antelope, Axis Deer as well as Water Buffalo; you just need to tell us your choice on which animal you prefer to hunt these 2 full days; could be only 2, or experience the 4 of them. Midday: Lunch can be organized at Malalcue Lodge, or even at the field, depending on the weather, distances, schedules and preferences. Afternoon: After a short relax, your hunt will continue during the afternoon, as it was scheduled previously. After this hunt, we’ll drive back to Malalcue Lodge, for dinner, SPA, and relax time. Morning: Your last morning can be organized with a Dove Hunt, Dorado fishing, or Big Game hunting, according to your preferences. Depending on your flight schedules, we will transfer you back to the airport where we will be assisting you with checking in with the airline.